The young internist, an Orthodox Jew, had graduated from Yale Medical School in the spring of 1954 and gotten married the following year. A week after his wedding, he'd entered the Navy with the rank of lieutenant. Now he was the medical officer on the USS Lindenwald, a dock landing ship steaming in the Arctic Ocean as part of a squadron charged with supplying the DEW Line — the far-flung Distant Early Warning network of radar stations built to detect incoming Soviet bombers in case of an attack on North America. For three months each summer, before polar ice made the seas impassable, multitudes of military personnel brought construction materials, communications equipment, and fuel to the web of northern bases stretching across Canada. Among the officers of the USS Lindenwald in 1956 was Lieutenant Elihu Schimmel, M.D., the only Navy doctor in the Arctic Ocean. As the only Navy doctor in the Arctic Ocean that summer, Schimmel was responsible for the medical care of men on dozens of ships. Often he had to be transported — by helicopter, by launch, by seaplane — from the Lindenwald to another vessel to see a patient. But with Rosh Hashana (the Jewish New Year) and Yom Kippur (the Day of Atonement) just around the corner, Schimmel was wondering whether a few men could be moved in the other direction. Specifically, a few Jewish men: enough to assemble a minyan, a quorum of 10, so that services could be held on the most sacred days of the Jewish year. There were a few other Jews on the Lindenwald. One was an Army private named Sam Levin, who was assigned to the 588th Transportation Company. 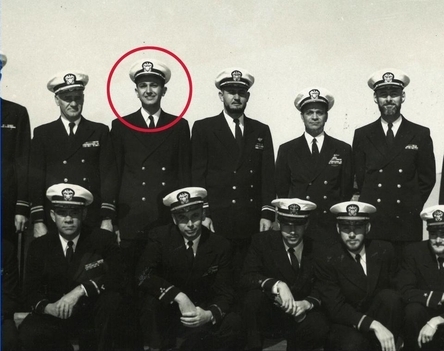 Hundreds of men from the 588th were serving on ships throughout the area, and Levin knew quite a few of them, including several who were Jewish — enough, he told Schimmel, to make a minyan. If they could get those guys aboard the Lindenwald by sundown on Sept. 5, they could hold proper Rosh Hashana services — perhaps the first ever to be held in the middle of the Arctic Ocean. But would the Navy and Army be willing to indulge a few Jewish service members? Would it go to the trouble of transporting men to the Lindenwald and let them temporarily skip their regular duties for religious reasons? Schimmel didn't know, but — nothing ventured, nothing gained — decided to ask. They were as good as their word. By the afternoon of Wednesday, Sept. 5, a handful of Jewish troops from other Navy vessels in the Arctic were aboard the Lindenwald. That day's shipboard "newspaper" — a mimeographed handout called "DEW Line Daily" — matter-of-factly listed "the schedule of Jewish Services for the High Holidays," to be held in the Crew's Lounge that evening. For the benefit of curious readers, it went on to explain the significance of Rosh Hashana and Yom Kippur in Jewish culture ("days of repentance and of rededication ... called collectively the Days of Awe ... according to tradition, everyone is judged ... ends with a final sounding of the ram's horn"). After Rosh Hashana ended, Schimmel dashed off a quick letter home. "We had 100% attendance, which fortunately was just 10 boys," he wrote. "Only one other boy read Hebrew . . . so we had services mostly in English. Took 2-2½ hours both days. . . . Ship & Army personnel were very cooperative and interested in the services — Commodore (via chaplain) came through with an official dispatch to release all Jewish personnel for services — I really never expected any airborne lift to assemble us! I'm very grateful." In reality, the US military establishment is remarkably broadminded about religion. As far back as the Spanish-American War, thousands of Jewish troops were granted furloughs to attend High Holiday services. During World War II, with more than half a million American Jews in uniform, military commanders authorized High Holiday services and Passover seders, many of which were attended by hundreds of service members. Some of those services ached with poignance: In 1945, some 500 Jewish GIs assembled on Rosh Hashana to pray in Verdun, France — a city from which every Jew had been eliminated during the Nazi reign of terror. To this day, Elihu Schimmel glows when he recalls the respect with which he and his fellow Jews were treated as they prayed aboard the Lindenwald in 1956. 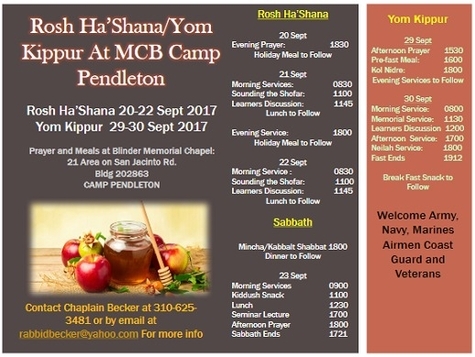 When the High Holidays begin at sunset next Wednesday, Jewish soldiers, sailors, airmen, and Marines on duty around the world will again gather in prayer, with the full support of the US military. May those men and women, and the grateful nation they serve, be blessed with a safe and sweet new year.